THE NORTH DAKOTA HERITAGE CENTER expansion in Bismarck has created a new tourist destination for the State Historical Society of North Dakota. 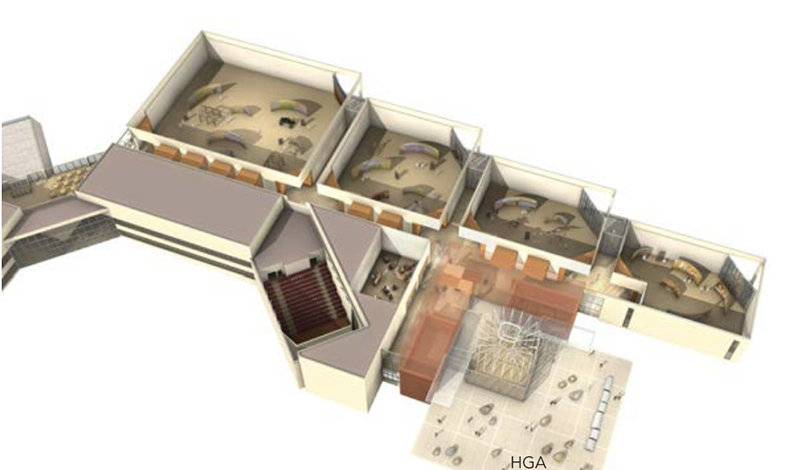 The 97,000-sq.-ft addition, which opened last fall, was designed by HGA Architects and Engineers and nearly doubles the original Heritage Center, adding expanded galleries, learning labs, a 60-seat digital theater, conference space and a café. Architecturally, the Heritage Center presents a dynamic community presence on the State Capitol campus. 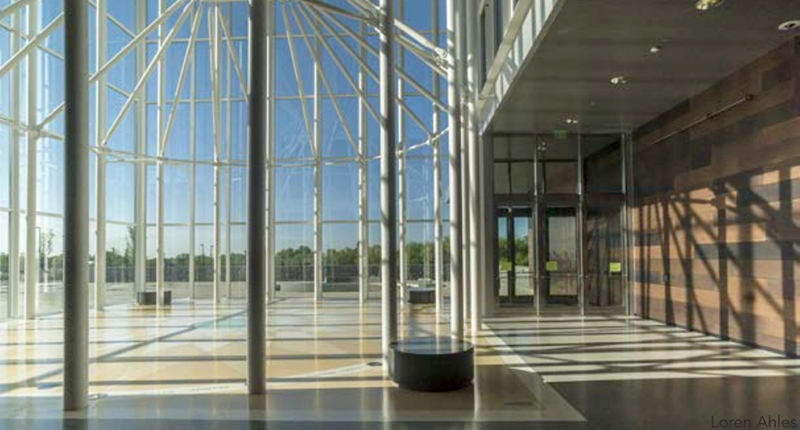 The limestone exterior complements the existing campus buildings while a glass-and-steel Northern Lights Entrance Atrium gives a nod to Native American architecture. 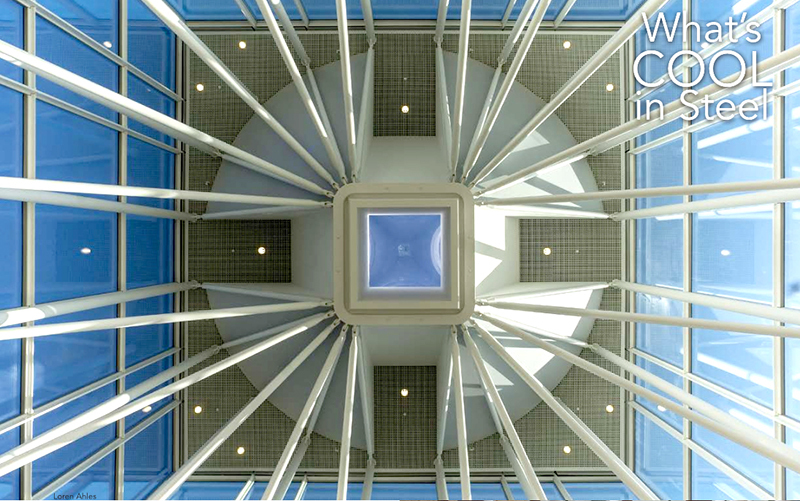 As the building’s centerpiece, the 45-ft-tall atrium is a striking example of architecture and structural engineering, merging to create a welcoming community space that serves as the heart of the Heritage Center. At night, the illuminated atrium is a glowing beacon to the community. The atrium incorporates custom unitized triple-glazed curtain wall with custom-welded T-shaped mullions made from A36 steel plate. The mullion connections, in which single plates at the top of the horizontal mullions were used with countersunk bolts for ease of erection, are discreet (and cost-effective). 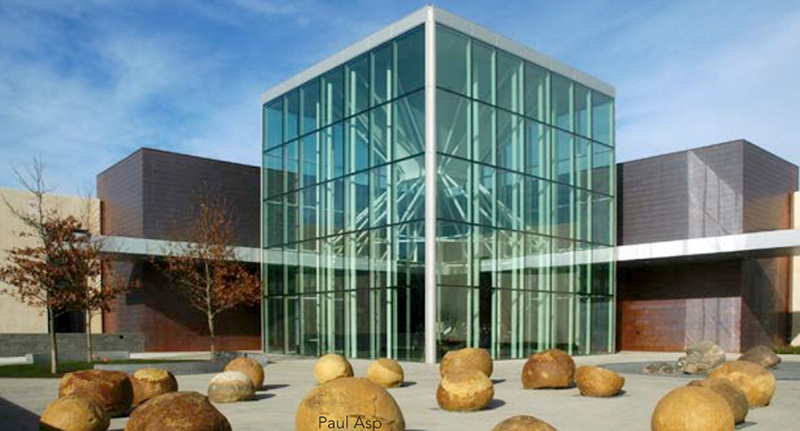 The glazing system’s thermal performance was crucial for achieving the large glass box design of the atrium in the harsh winter climate of North Dakota, and the system’s significantly improved condensation factor reduced the need for heat on the glass. The rainwater leader for the atrium roof and conduit for the lobby lighting were hidden in a corner mullion, and a hole in the mullion support beam allowed the pipe and conduit to continue unseen into the low lobby roof framing hidden behind the finishes. Twenty 8-in. 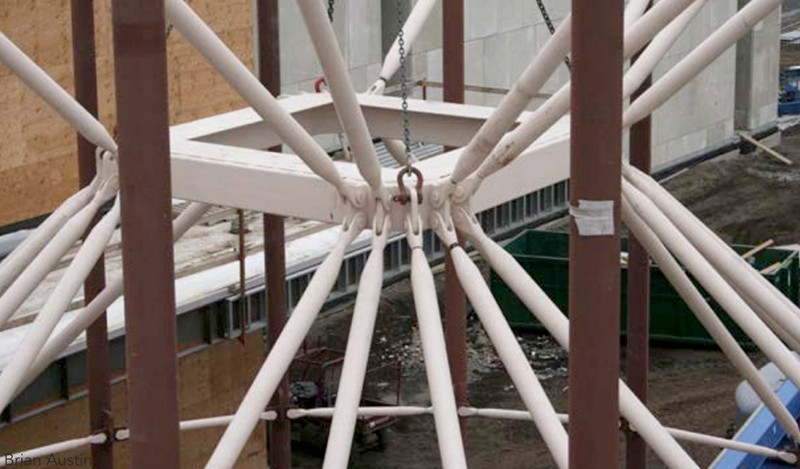 round HSS columns support the atrium roof at the perimeter. 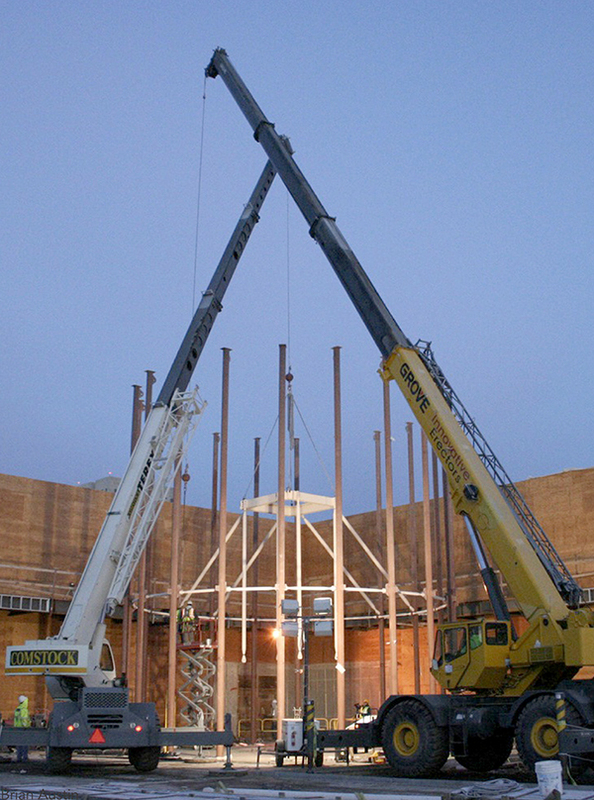 Compression struts framing from a central compression ring provide bracing for the pipe columns and T-mullions, and the clevis system used for the struts connection is fully field-adjustable to aid in erection. The project team modeled the lobby’s entire structural system in Revit as a parametric family so that the system geometries could be adjusted during design development. Synergy Steel Structures, Inc., of Lansing, Ill. (AISC Member/Certified) was the project’s fabricator. The struts and compression ring system act as bracing for the columns and mullions under gravity load and also serve as the lateral system of the atrium box. Wind loads are transferred from the exterior mullions through the struts and compression ring to four connection points back to the main building at the low lobby roof and through to the mechanical mezzanine level above the adjacent lobby. The composite slab diaphragm distributes the lateral point loads to the braced frames within the main building structure. 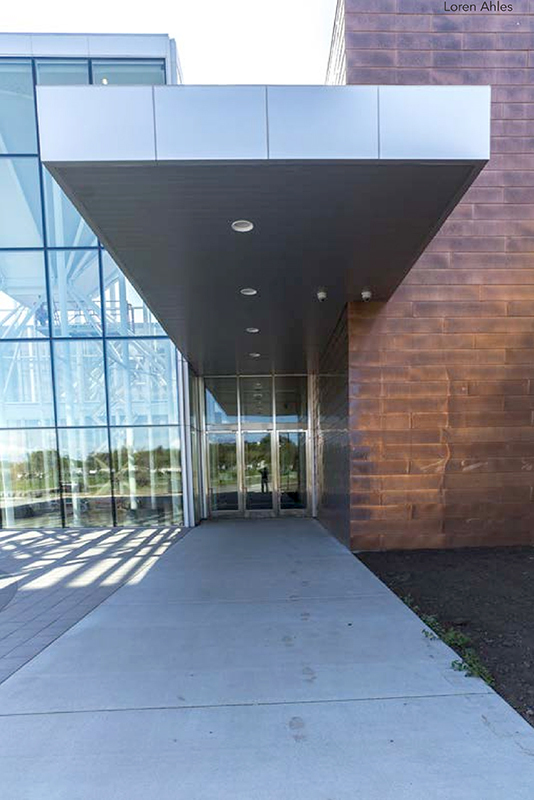 Surrounding the atrium is a copper, L-shaped element that includes cantilevered canopies at each end and cantilevers for the lobby roof along the atrium sides. The end cantilevers are 16 ft while the low lobby roof cantilevers extend 13 ft, 6 in. from the building’s column line. The canopy and roof framing design was complicated by the glass atrium’s steel mullions, which bear on the cantilever tips of the low lobby roof framing. Because the shallow structural depth required heavy beams for the long cantilevers, anticipated dead load tip deflections were specified and the end plate moment connections to the columns were fabricated with the beams skewed at the plate. Other canopy and low lobby roof detailing included setting the roof deck down into the beams to minimize depth and multiple variations on moment connections that were needed to deal with the double cantilevers, various column conditions and in-framing beams at different elevations.